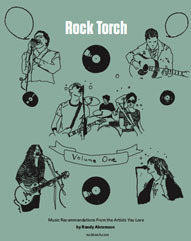 Buy the Rock Torch Book! Sorry, no content matched your criteria. Publishing music recommendations from the bands and artists you love since 2010! Buy the Rock Torch book on Kindle or in paperback format! Profits from the book go to The Sweet Relief Fund and to help Hurricane Sandy victims. Check out our list of Rock Torch approved sites.